This huge inflatable tent will DEFINITELY get you some attention. 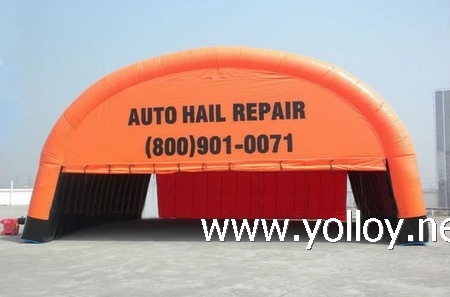 If you’re an auto hail repair service and you want to be able to attract some attention while also getting plenty of shade and car lot space, these large inflatable tents are ideal for you. This particular tent was designed to be transportable. During the raining seasons, hail storms can definitely cause some damage. Setting this tent up at a local super market or private lot can dramatically increase your business. This will make the tent easily viewable, due to its massive size, and also the fact that it will be at a busy, well-known location. We also provide digital printing, so the tent can be customized however you want.